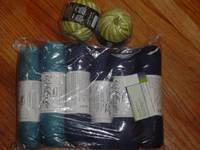 Thanks to Yarn Tomato I discovered Adagio Tea. I am a tea lover, mostly green teas but sometimes reds. I drink a cup every morning with my oatmeal and at least one during the day and another at night. I love Tazo teas (Lotus and Zen are my favorite) and the Yogi Teas. But Adagio Tea isn't just tea it's an experience. I ordered the starter kit which includes the IngenuiTea tea pot and four tea samplers, only $19.00. You have to watch the video. First you put the tea in - it's these big beautiful leaves and the smell is amazing- then you add water (our Culligan water cooler has the perfect temperature hot water- 180 degrees F). The leaves dance around in the water after a few minutes you place the teapot on a mug and it filters down into the cup. It's really the most wonderful cup of tea I have ever had. 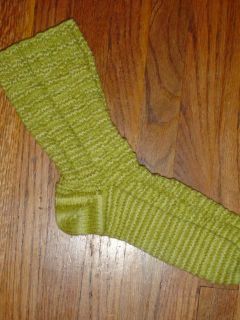 I decided on the green Fixation for my sock pal. I love how stretchy it is. The pattern I picked works well with the yarn and I'm overall happy with the results especially the heel. Now I just have to get the second one done. Also I just have to say that Silk Chocolate Soy Milk is one of the tastiest drinks that has ever passed my lips. It's not really like Chocolate Milk, it's more like drinking chilled chocolate. Personally, I do not like the way that regular cow's milk tastes. But I love Silk Soy Milk, Vanilla is very good- perfect for cereal. Sorry just wanted to share. Sorry I haven't been around much lately, Tren's been sick. 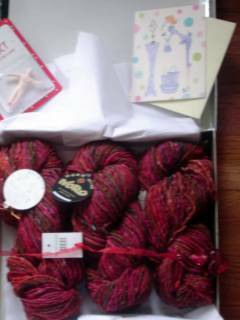 So I was at a loss for what to make with my 3 beautiful skeins of Noro that my secret pal sent me. Then I saw Earl, it's perfect. I have the very best secret pal in the whole world. Yesterday, when I got home there was a package sitting on the porch. I knew I hadn't order anything lately, but when I saw my name on it I knew it had to be from my secret pal. I brought it in and looked through all the rest of the mail, I love to have that excitment of wondering what's inside. When I couldn't stand it anymore I torn the box open. Check it out. First there's this great card, a beautiful bookmark, and "The Perfect Man"( a little plastic guy that expands in water, so cute). The best thing was the Noro Iro, it is perfect!! If I had seen this at the yarn store I would have bought it for myself. I love the colors, the texture, even the smell. I really can't put into words how much I adore these gifts. Thank you so much. What will I use for my sockaplooza pal? I ordered 6 balls of wildfoote in different blues because she said she wears a lot of jeans. Yesterday I got 2 balls of Fixation in a green variegated because she likes green. But now I can't decide which colors to use, at least I think I have the pattern picked out. We had such a fun day. 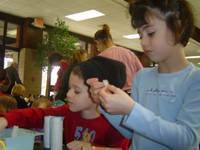 Our local botanical gardens was having a "February Family Fun" Day. They had tons of activities for the kids. We made dry flower crowns, Valentine's, planted a Vick's plant, made a grass hair guy, toilet paper roll binoculars and a lot more. The best part was the kids got to hammer together their own bird feeder, I felt bad for the guy working that booth. He was holding the nails and the kids kept missing and hitting his fingers. I'm sure by the end of the day he was black and blue. 600 meters of singles, ready for dye and ply. 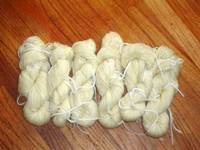 This is the most wool I have spun at one time. The kids were having a great day on Sunday playing so I was able to spin and listen to NPR most of the day. Now comes the hard part- what colors and what to knit with it.